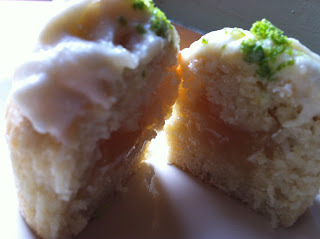 Bank Holiday Monday - aside from some very lush Coconut Cupcakes, with a gooey lime curd centre, topped with white chocolate frosting and a sprinkling of lime zest (see below), I decided to try my hand at making that good old Scottish staple - Tablet. For those of you not in the know, tablet is a (very) sweet treat somewhere between fudge and a coconut ice type texture. Made with sugar, condensed milk, water and butter it is good for inducing a diabetic coma, or increasing footfall in dentist surgeries. 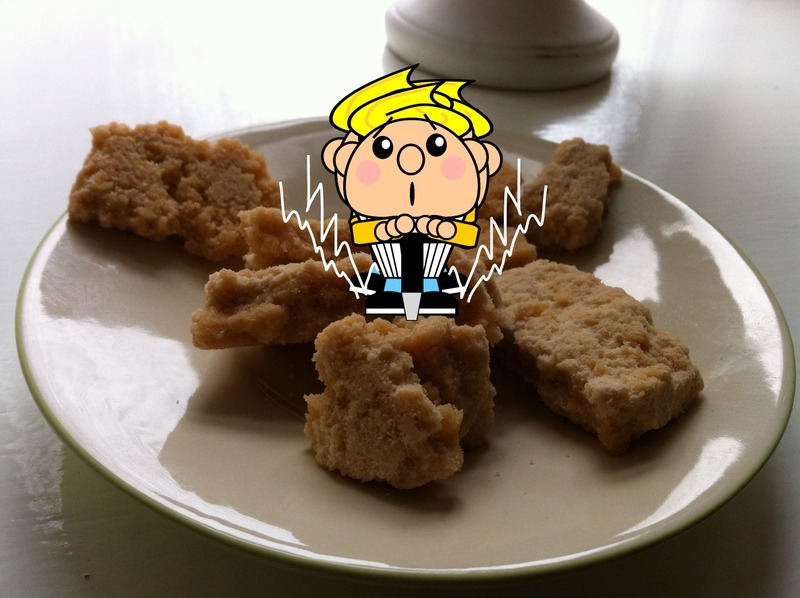 My Granny Hetty was a legend at making tablet and it is the one thing I have never tried. After my Gran passed, my Mum tried to make tablet, but the result was something that I christened toflet - a weird hybrid of tablet flavour but all the stringy, chewiness of toffee (perhaps there is an idea in there somewhere???). Anyhoo, I found a recipe and dug out a heavy saucepan. Now, no temperatures were mentioned in the recipe and the term 'softball stage' was used - and due to my aversion of manly sports I glossed over this part. I stirred the thing for 20 minutes (despite the recipe saying it should turn caramel coloured after 10, which it didn't). Enough's enough I thought and removed it from the heat. I whisked it very thoroughly for a few seconds and it suddenly seized on me. I poured scraped it into the prepared pan and pressed it firmly. To my amazement it did set in parts. But was solid,and crumbly, and delicious! So I have popped the large pieces in some paper 'pokes' and will take them into work tomorrow. And with the leftover crumbly pieces, I have popped them in a little plastic baggy and shoved them in the freezer (you can freeze tablet - who knew!). They will make a perfect sprinkling for my next frosted cupcakes. With the cupcakes I waited until they were cool, took a pairing knife and cut a cone shape from the top and then used a melon-baller to remove some more cakey goodness. Piped in some shop-bought lime curd (70p a jar - Mackay's Factory Shop - bargain!) and popped the tops back on. Frosted over the tops, grated the lime zest over them and bob's yer uncle. Yum! Thank you so much for sharing your recipes :) Cakeyboi - is he your own creation? He is - although he looks a bit like Dennis the Menace (the American one) I've just realised!. My aunt makes tablet and sends it down to London for us but after a few mouthfuls my teeth are on edge. These cupcakes look yummy though and next time my aunt sends us tablet I'll have a go.